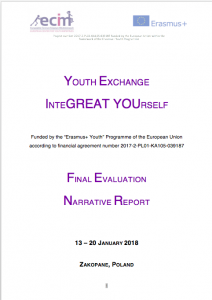 5th publication, fully prepared by European Center for Youth Initiatives, based on the implementation process of ‘InteGREAT YOUrself’ project in cooperation with partners from Croatia, Cyprus, Greece, Italy and Romania under Erasmus+ Youth Programme. Report showing the whole process, tasks within activities, their aims, photos, is using data collected during Youth Exchange implementation, daily evaluations made by participants, online questionnaires results as well as photos and graphics showing character and category of each activity. Publication is one of the key elements of complex project evaluation. Great time, spent together with other 35 friends! Waiting for more, in any country participating here, it was a great possibility to learn more about connections, closeness and feel that we are all really similar with different elements of our cultures. Thanks a lot ! ECIM seems like a great organization to be a part of. Marcin and Ola are amazing people who run it and they are doing a great job because you can feel they love what they do. We were able to learn some new information and gain valuable skills while also having lots of fun. The atmosphere was perfect. I didn’t feel like I was being lectured by someone, we were all involved in almost every aspect of the project so we all felt united. They were flexible with us and I really apprreciate that. Polish cultural night was the best cultural night I’ve ever been to. It felt like I was on the Polish wedding, you could really see how they do it in Zakopane. Big thanks to Ola and Marcin, and also to your little helpers Wiktoria and Dominika. Let’s add Patryk and Kora to this list and say Thank you my Polish friends for showing me how great people you are. If you want to learn while having fun, I would recommend you ECIM. They are really ke nice! The project and the organization are great: there isn’t wasted time and all the activities are intresting and well done. Everybody should give thyself the chance to get out from the comfort zone and to know something more about themselves and the other cultures. If you have this opportunity , take it: you will not regreat it. I came here with a lot of expectations because my friend went to a project with the facilitators and the same venue. I was told the experience was amazing. My expectations were met and I’m very happy with this youth exchange. The group was so easy going and everything went smoothly. Best youth exchange in my experience. Before this one I didn’t want to go to youth exchanges but I still went to this one. Now my faith in youth exchanges is restored. It is such an amazing organization. Marcin and Ola are so dear and wonderful. They keep everything very organized and the project is able to flow smoothly. The schedule of the project was really flexible and not so tight and pressured as on other projects I participated. They were so patient with us and did whatever was in their power to help us be really comfortable and safe of which are the prerequisites for growing and getting out of your comfort zone. Thank you very much and keep doing what you’re doing right now. Grow and learn but don’t change a lot, because you are awesome !!! For me InteGREAT YOUrself or # GREAT_YOU means: Initiative New Tolerance Experience Gratitude Respect Actions Time Energy Youth Organization Unique Responsibility Sustainability Empathy Learning Friendship – OR – Goals Recreation Easy Acceptance Team Young Objectives Understanding. Unique experience, definitely worth it! A program that puts the tower very high! A program that would envy even a university cycle program! Very well organized. Excellent preparation. The organizers are qualified and fully trained. Ηaving communication skills, ability to enforce and reinforce the participants’s spontaneity, express emotions and ideas. I saw that you can finally learn things through gameplay and fun, and that you can have even more positive and more consistent results than usually the official education systems have. I feel richer after this experience. The project InteGREAT YOUrself organised by ECIM was my favourite so far. I was suprised by how well everything was prepared already before departure, for example the info pack was rich in info and the organisers were easy to contact and more than ready to help. The workshops were not only great and very educational, but also fun and enjoyable. The entire project was perfectly balanced-there was time to have fun with new friends and the atmosphere was relaxed and comfortable, but we also worked devotedly to make something together. I have only good words for this organisation, wish them many more projects like this one and can only recomend to others to take part in them! Spend a week with 36 amazing people from 6 different countries. This was definetly a life changing experience for me! I learned many things both through the workshops and by interacting with people from different countries. After this project, I definetly feel more confident and I believe I became more tolerant as well. What is more, I was able to express my thoughts on the topic and listen to what others had to say about it, therefore I developed a more objective point of view . Everything was perfectly organised! I can’t wait for the next project ! The project was with one word just “PERFECT” . Everything , like seriously, everything was perfectly organized! From the schedule, the activities , the hotel , the trips until the finest detail, the fact that we were in every moment and activity in a circle so everyone had the opportunity to talk and listen to each other! In this specific project “InterGREAT YOUrself” i’ve made memories that will last a lifetime… I’ve created friends ,real friends, and i know that if i ever visit one of the participant countries i would have someone that would help me and be by my side…. I’ve also had the opportunity to improve my communication skills and my skills in english because we had the chance to talk much about different and interesting topics! Furthermore i’ve learned new languages and more specific Italian <3 and Polish from my lovely friends! All in all the project is a memory that i’ll never forget and obviously i am waiting for part 2! It was my first youth exchange, a nice experience! I spent a week with other 35 young people from other counties, and they opened my mind! I really learnt what “collaboration”, “organization”, “partnership” mean, discovering new traditions and new cultures. Nowaday I feel more confident and ready to meet people from all parts of the world. Ola and Marcin were excellent “big leaders” that knew how to involve us in the games and how to make us fell at ease! Thank you all, mostly Ola and Marcin! InteGRATE YOUrself was a special experience from which I learned many interesting things. The project was organized very well and I never felt that something was missing or that some things were not related with the topic of the project. Ola and Marcin were the soul of the project. Thanks to them, the project was a success and all the participants felt extraordinary. Youth Exchanges with ECIM are really unforgettable experiences! During the project you can learn more about its topic, but also improve your English, learn more about other countries and meet amazing people with many points of view and ideas. I did all of those things! The project was well planned and prepared. Everything was for us! The organizers wanted to make us happy and they were doing their job as well as possible. Every time when i try to find the negative aspect of the project i can’t, because there was nothing boring or useless. I was waiting for this project with impatience and now when I am after it I am very happy! I spent great time with fantastic people from many countries and i can’t believe that it finished. I am sure that if I could turn back time I would do it, because that experience gave me new possibilities and taught me how to be more intercultural! Thank you ECIM, for everything! I already knew something about Youth Exchanges before taking part in this one and I tought they were a beautiful experience, but now, after having been in Zakopane for ten days to participate at the project InteGREAT Yourself, I’m absolutely sure they are a great experience. This project was full of moments and sensations that I will remember: the location, the activities, the flow in the group, the energy of Marcin and Ola, all the details contributed to create a special atmosphere that it would be difficult to recreate. As lots of us said in the final evaluation, everything was perfect. I’m saying it because during this project I was deeply in touch with interesting and curious people and I realised that finding something in common with people from different country is much easier than I tought. It gave me a lot of positive energy and made me feel comfortable all the time. Moreover, I was never bored during these days, but always curious about what we were going to do, excited and interested while doing it and happy and satisfied after. In sum, this project gave me lots of things that is difficult to express in words. I can only say that thanks to it I am enhanced from different point of view and I can only be grateful for this. In my view, the project was a much needed experience to get out from my comfort zone. I became less shy, more flexible and self confident and now I feel like my fears can’t stop me from discovering the world and its people. The project itself was well organized, all the activities were interesting and useful, I also appreciated the fact that the schedule was not so strict but suitable to our needs. The atmosphere was very easy going, which permitted us to feel comfortable and create a great team because we felt like nobody was going to judge us. Finally, the cultural evenings were all awesome: the perfect opportunity to learn more about the other countries, socialize and have fun! I would like to thank Ola and Marcin for this amazing experience and all the people who took part in the project! I heard for Marcin from a friend who also has a similiar NGO in Croatia. He told me his projects are really good and that I should definitively applied for this one. So I did. First of all I met the best people from all around the Europe and while working together on workshops, living and hanging out together we really made a special bond. For me this was a third project so I had some experience with youth exchanges, but this one, I must admit was the best regarding organisation. I never attend a project before on which literally all the workshops were so interasting, but in the same time we all had so much fun. In the end, I learned a lot and now I want to go on even more projects. Beside this, Polish cultural night was the best cultural night ever. I was never present on a night where so many things were presented… from traditional food, music, local dancers with band, games… well basically everything was done perfectly to present the culture of region around Zakopane in the best possible way. Big thanks to Ola and Marcin for making something like this happened and I wish you guys all the best in the future and your carrer. it’s my second youth exchange but with ECIM was the first and the most remarkable. Everything was perfectly organized through workshops we learnt a lot of things and at the same time we were enjoying ourselves. I can’t omit the subject of the programmme that is on the frontline of participant counties and I had the opportunity to be accustomed to their point of view. Moreover, Marcin and Ola made us feel like home not only with their positive attitude but also by being part of our company. In conclusion the best organization , I wish many people took part and live this inteGREAT experience……. These days, I’ve met a lot of amazing people from different countries, what let me have a lot of unforgettable moments and experiences. It was a great time, during which we built a team, we learnt a lot, as well as we could become closer as citizens, friends, humans. Great project for raising intercultural awareness and believing more in ourselves! The project was great! I have never taken part in an Erasmus+ project before but I will take the next opportunity to do it again, surely! Marcin and Ola organised everything very well; for me, it seemed flawless. I became very comfortable throughout these 10 days to speak publicly and develop my self-awareness in a way in which I can express my ideas fluently, calmly and thoroughly. Working together within my own team resulted in productive example of collaboration with the result of an enjoyable cultural night and workshop. I developed close relationships with many participants, learning of their particular points of view, struggles and dreams. It was a great exchange of experiences which offered a platform for empathetic feelings and showed me the qualities in people, going over and above preconceptions. Being funded by the EU, activities and programmes as such are a great way to get citizens of this Union to work together and see what they have in common; learning about their differences and the reasons behind different ways of thinking. The more we know, the easier we can accept each other. This was my first visit to Poland as well and it was an educational one. I thought I knew many things about Poland, attributing general Eastern European characteristics, but in reality, the culture, diversity, influences and spectacular sights blew me away. I’m definitely a Poland fanboy now. This was a great experience that will definitely stay forever in my mind! It was a great opportunity to meet people from diferent countries and to understand that we are so different but so similar at the same time. We shared a lot of stories, facts, worries and thoughts through the workshops or through the time that we spent together and this was the best way to open up and feel comfortable. The whole project was full of quality time and wonderful moments! Taking part in the Youth Exchange InteGRATE You was an amazing experience. Marcin and Ola have been in charge of planning everything from A to Z in order that everyone will feel comfortable and will have a nice experience; starting with the transport, accommodation, food, special requirements and the most important part the plan for each day of the exchange that helped us to get to know each other easier and become comfortable with the other participants; talking about the topic of migrants, debating the current situation in Europe and in each country that we are coming of was made in a non formal way so, sometimes we felt the need to continue the discussion in our free time. Definitely an experience hard to forget: 36 strangers at the beginning that after 10 days are planning to visit each other, learn new things in an interactive way, and be surrounded by a positive vibe that Ola and Marcin are spreading all the time. Guys, keep doing the same amazing projects! Even though I took part in many youth exchanges this one was unique and unforgettable!! Very organized from the first, until the last minute! Food, accommodation, workshops, building games and etc! Interact with 35 more people from different countries is my favorite part, we meet new friends, we learn about their culture, traditions and the end we discovered that we are so different but so similar the same time! We were talking, discuss and dancing all night long everyday!! I can talk about this project for hours..! Keep doing such GREAT projects Ola and Marcin! See you all around Europe!! Great experience beyond expectations. With this project you learn and know many things about other cultures. Furthermore there are many constructive activities. I recommend everyone to try this experience. The project was great! From the beginning until the end of the project everything was amazing, this means that everything was calculated for our own comfort and our learning process. The program was well thought out so we had time for everything! I became very comfortable in these days and I enjoyed all the activities that were proposed to us, because almost every activity was challenging for me and for my teammates! It was a GREAT experience, very organized project and GREAT team! Thank you for this opportunity! I hope to see you all again! Life changing experience! It was more than great to be in this project which was perfectly organized by our amazing leaders Marcin and Ola who encouraged us to leave our comfort zone, interact and integrate ourselves. We gained memories and friends that will last for a lifetime. I wish everyone could live such an experience! Really thank you Marcin and Ola cause through this project I became a better PERSON. I’m sure that we will meet each other again. It was just GREAT experience! GREAT participants, GREAT place, amazing atmosphere created by those GREAT people! Everything was going just perfect and mostly because of attitude of each and every member of the team. I was amazed how everyone developed his/her skills. Watching this progres happening in each participant was my biggest pleasure! Participating in the Youth Exchange InteGREAT YOUrself was amazing experience. Every day I was feeling comfortable and safe ,because of the atmosphere in the group. Everyone was ready to help and support in any activities or workshops. Day by day I learned more about traditions and cultures other countries. We talked about migration and how it looks in the different views. We made great team, because we were open minded (from strangers to friends ). It was just 10 days but thanks to Ola and Marcin, because of you we had really good organized project. Every evening with you guys was unforgettable. It was my first youth exchange but now I know that It wasn’t the last.